Front Wheel Travel 185mm / 7.3 in. Rear Wheel Travel 14mm / 4.5 in. Length 2230 mm / 87.8 in. Width 916 mm / 36.1 in. Height 1460 mm / 57.5 in. Wheelbase 1516 mm / 59.7 in. 14.1 m / 46 ft. / 42.1 m / 138 ft.
By 1983 BMW really wanted to get rid of its line of air-cooled boxer (opposed-twin) motorcycles, that had been around since dinosaurs roamed the earth, well, since 1923, anyway. The future, BMW thought, lay in its new in-line water-cooled fours and triples (known throughout the motorcycling world as the "flying bricks" because of the bulky, squared-off looks of the engine). The fours came in 1000 cc capacity, while the triples were 750s. We all know how that panned out: customer insistence that only boxers were "real" BMWs led to the development of the new oil-cooled line of boxers that are still with us today. The K75 made its debut in 1985, and over the years, a number of variants were produced. There was a sporty-looking S, a general-purpose T and a touring RT model. The four-cylinders are still with us, in three different 1200cc models. But by 1995 the bells tolled for the K75. Although it was still selling strongly, the end of this line of bikes was firmly announced by BMW. This caused an uproar among the BMW dealerships. Many of them had been supplying K75s to local law enforcement agencies (yes, the speedcops) and had lucrative long-term contracts to deliver cop bikes. In response, BMW quietly re-opened the assembly line one more time and produced one last batch of K75s for a few select markets only. To show that these really would be the last of their kind, they called it the "Ultima" (apart from South Africa, I know there are Ultimas in new Zealand. But the Yanks seem never to have heard of it). And that is where my bike comes from: probably built in 1996 and although it doesn't have the full touring fairing, first registered in 1998 as a K75 RT. But the K75's mechanicals didn't actually change much during its lifespan, and I doubt my impression of this model will be wildly different from any others in the series. I bought the bike in 2003 while still in a state of shock: a free-lance socialist had made away with my beloved F650GS and I was waiting for the insurance to pay out when I spotted this blue brick in the BMW showroom. Only 20 000 km on the clock, and at a price I might actually be able to afford. Panners and windscreen were included, and as it turned out, this was the last BMW model to have hand-painted pinstripes. I called the local BMW mechanic, a guy I trust, who informed me that the previous owner had been one of his fussiest clients and that the only reason the kilometers were so low for a five-year old machine was that the guy owned four other bikes! Three days later I came back and bought it. Another 20 000 kms down the road with this bike, and I feel I can comment on it. There are bikes with which you have an instant love affair that cools down after a few months. And there are bikes that make you wonder if you did the right thing for the first three months, after which it grows in your affection as you come to appreciate its good points. The K75 belongs to the second category. For a long time, I struggled to bond with the bike. Coming off a 650cc semi-dirtbike single, it felt enormous, like riding a hippopotamus. Then came a 1000 km trip to Bloemfontein and back, and it was in its element. It has served as my daily ride to work and weekend distance-chomper ever since. Nobody ever called the K75 a powerhouse. BMW claimed 75 bhp @ 8500 rpm. They must have been celebrating something with lots of schnapps when they measured that. 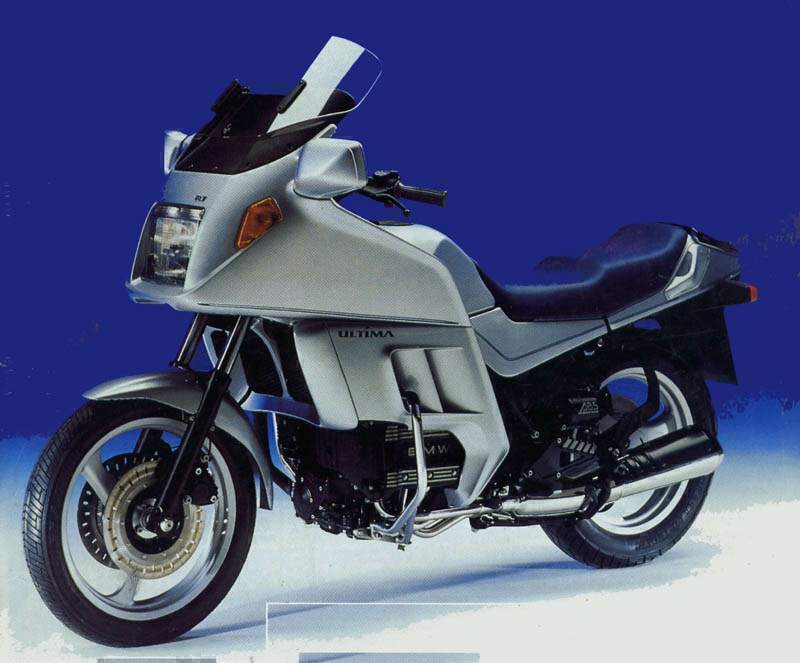 Even when it was introduced you could get better performance out of a Japanese 500cc. But while there are not too many horses in there, they are horses with thick, short legs, and they tend to gallop around the mid-range. It will cruise at 140-150 km/h all day without complaint at about half-throttle. Top speed? I've seen 185 on the clock. Let's call it 170 km/h in real life. There is a redline at 8500 rpm, but it is not of any real interest. Keep it between 3500 and 7000, and you will get the best out of this machine. I have no problem keeping up with my BMW clubmates in real-life riding. It will do. The K75 has a counterbalancer and is regarded by those who have ridden both as smoother than the un-counterbalanced four-cylinder models. I wouldn't know about that. What I can say is that while you are always aware that there is an engine going beneath you, it never becomes obtrusive. I've done 800 km days on it with no more ill-effect than a slight numbing of the hands. And that was on day four of that particular trip. Even so, when I lost a bar-end weight I replaced the grips with foam rubber items. The gearbox is traditional BMW clunky. How do you know when the group of bikes waiting for a traffic light are all BMWs? Just listen when the light turns green. Clunk! Kerr-chunk! Crack! Clunk-Clunk! This is something you just have to get used to. You don't change gears on a BMW by vaguely waving your foot in the general direction of the gear change. You place your foot where it should be and p u s h.
Handling? Well, that's different. Maybe unique. First of all, the suspension is straight out of the 70s. Rear is adjustable for preload, front is adjustable for nothing. The design of the rear suspension predates modern ideas of how to build a monoshock. Basically the swingarm, shock, drive shaft and rear brake are all on the right-hand side. Seen from the right, it looks like an old-fashioned dual-shock bike. Seen from the left, the rear wheel just floats around in space. Up front, there are perfectly conventional telescopic forks. This arrangement doesn't facilitate "floating" over road irregularities like the best modern bikes (when they are properly set up, but that is another story). If there is a bump in the road, you know about it. When you have to brake hard (and the three Brembo disks pull the bike up smartly) the front end dives like a submarine (Editorial Note: I wonder if this is the bike that spawned research on the telelever system?). If the bump in the road is in the middle of a turn, you will find yourself airborne while leaned over. The suspension is just too antiquated to deal with such things. But here comes the strange part: once you land and your wheels touch tarmac again, the bike will simply continue cornering like nothing had happened. You are still on the line you chose at the beginning of the turn. No head-shaking, no rear-end waggle, nothing.To see how this is possible, we have to look at the frame. The K75 frame is basically a shortened version of the frame fitted to the K100. This explains how the bike is so heavy (BMW claims a dry weight of 204 kg - yeah, right, more schnapps, Helmut? ), but also why it is so rigid. Remove the saddle and you look down at two thick pipes that could probably support an oil tanker. This is the bike's secret weapon: no matter how much the suspension throws you around, the frame refuses to flex. No namby-pamby extruded aluminium here, just good old-fashioned steel tubes bolted to the engine. To get the K75 to go around corners takes a serious nudge on the handlebars. This is not a modern sportsbike that steers with minute shifts of the rider's weight. You have to countersteer it. Once in the corner, it will stay on that line until you countersteer it upright again. This happens to suit me: I prefer bikes that don't start turning without my express permission. Overall impression of the handling: solid, very solid. Given an experienced rider, the K75 can be hustled along. Problems? I've had a battery die on me (acceptable, for a six year old machine), and a fuse blow for no reason that anyone could detect (that one still bothers me). Apart from that, nothing. The bike is fairly easy on tyres but seems to have an appetite for front brake pads. According to the internet forums, the whole drivetrain from clutch to final drive is pretty fragile and needs to be tended like a baby, or it will disintegrate in a mess of shattered splines. I haven't had that problem myself, but then again, I leave wheelies and burnouts to the young bloods on their 'Busas. Recently, I saw a K75 cop bike being brought in for its 160, 000 km service. It had never been opened up or had any major surgery done to it. So if you ride it like it was supposed to be ridden, the K75 can last well. Like all BMWs, the service interval is 10, 000 km. Which is great, but a lot can happen in all that distance, so keep an eye on your oil, water and brake fluid levels. Fuel consumption works out consistently at 16-17 km/l . That gives you about 230 km before the reserve light comes on, and after that you have another four Litresor so to get home. One thing about BMW multis: they always were known as thirsty beasts, at least compared to the boxers and especially the singles. Of course, the experienced rider ignores the idiot light and uses his tripmeter instead. The K75 is a comfortable bike. Not in the league of the Guzzi Espada Mark II or even the late airhead boxers, but comfortable enough. The seat is only slightly dished: there is enough room to move around but only just. Seat-to-handlebar distance is perfect for me, it places me basically upright and just slightly leaning forward. The seat-to-footpegs distance, on the other hand, is a little cramped. Against that, the footpegs are angled backwards by a few degrees, just enough to fit the natural way humans like to put their feet. Then there are those little touches that make people BMW fanatics. How can I ever again live without a digital gear indicator? Mock all you like, but how often do you feel around for a non-existent sixth or seventh gear on your bike? Then, have you ever wondered why BMW riders use their centrestands more than other people? Because it is so easy. Put foot on centrestand, flip out the concealed handle just in front of the left pannier, and straighten up. No heaving on the handlebars required. The sidestand on the K75, on the other hand, tips the bike over to a ridiculous angle. Did I mention panniers? I will never own a motorcycle without luggage capacity again! Panniers and topboxes turn a bike from an expensive toy into a practical form of transport. The panniers on the K75 were already second-hand when the previous owner put them on. The rubber seals had long since gone and I didn't have much hope of them being waterproof. Then I was forced to ride home though a subtropical thunderstorm. This isn't like your typical North European drizzle. You can easily get 20 or 30 mm of rain in an hour, visibility is down to about ten meters and anyone on a bike gets drenched down to the undies within seconds. When I got home, the contents of my panniers were bone-dry. I don't know how BMW did it, but somehow the whole design of the bike diverts water away from the pannier lids. It has become traditional in BMW roadtests for the journos to complain about BMW's indicator system. Yes, BMW uses three switches to do what other bikes do with one. This is true. It is also true that this is only a problem if you are a professional motorcycle journalist who jumps on and off different bikes all the time. If you own one bike and it is a BMW, you'll wonder what the fuss is about. The K75 has self-cancelling indicators, by the way: these were common as dirt back in the 80s but since then the bean-counters seem to have restricted their use to a few top-of-the-range models, even at BMW. My K75 sees most of its kilometers done as a ride-to-work hack. But it is a BMW, and it is on the long, open road that its true character shines through. Take it up to cruising speed of 140-150 km/h and it changes into that characteristic lope that BMW somehow engineers into all its bikes. It's hard to explain to non-BMW riders, but there is a rightness about taking a BMW out for a long ride, a sense of the bike doing what it was always meant to do. All those little bits of attention to detail start to add up and work together, and the kilometers slide away underneath you with minimum effort. So what kind of bike is the K75? In a way, it is a throwback to an earlier age, to a time when motorcycles were meant to be transport first, then fun. Today we see motorcycles being built to fit into smaller and smaller niches, and each niche screams "yuppie toy"; louder than the next. Like the Honda CX and Kawasaki GT lines, the K75 is a very honest motorcycle. Two wheels and an engine, going on for mile after mile. Go anywhere, do anything (on paved roads, anyway) and the further away the destination, the better. Not a great deal of performance, but not a great deal of maintenance either. I think I'm going to keep it.